The Parabolic SAR indicator supplied with NinjaTrader cannot be used with an input series other than price. We have recoded it so that you may apply it to other indicators. To do so, simply select any of the other NinjaTrader indicators as input series. The Parabolic Time/Price System developed by Welles Wilder is a method to find potential reversals in the market price direction. It is usually referred to as the Parabolic SAR (Stop and Reverse) indicator and is explained in Wilder’s book “New Concepts in Technical Trading Systems”. It is a trend-following indicator and can be used as a trailing price stop. The concept of the Parabolic SAR also draws on the idea of time decay. 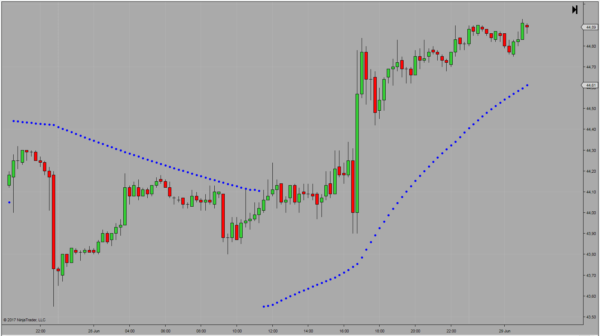 Positions are liquidated when the trend weakens and prices move sideways. Therefore the indicator provides excellent exit points. The indicator only works in trending markets and creates whipsaws during rangebound markets. Therefore, Wilder recommends to use the indicator in combination with a trend indicator such as the Directional Movement Index or the ADX as a filter. This version of the Parabolic SAR may be used with nested indicators.